Should You Charge Your Grown Kids Rent? Cover via AmazonThings sure are different these days. With the bad economy and lack of jobs more kids are coming back to the nest to let the parents take care of them. I guess I was lucky, I moved out at 23 years old and have been supporting myself ever since. In my house we have 5 grown kids and one 12 year old. The oldest has been out for several years, three are in college, and one is just bumming around. With the 3 in college, one lives at home and the others away. The ones that are away love their freedom and do not want to come back. But the one resident child we have has no intention of leaving for the near future. His failure to launch or even prepare to launch is frustrating us. It has crossed our minds to charge him rent. Financially it is our plan to downgrade in house so as to cut down our expenses and save more for retirement. Plus the large house takes a lot of money for maintenance, which could be used for savings and fun. With no plans to leave the home we are getting anxious over the problem. How Do You Help Your Grown Kids Financially Without Hurting Yourself? There are two sides to this issue. Many parents see it as their duty to continue to care for their children no matter how long it takes for them to become independent. They may feel as if they are taking advantage of their children by taking rent money from them, especially if the child is living at home to save for a house of her own. On the other hand, many parents believe that charging rent helps their children mature and learn responsibility. 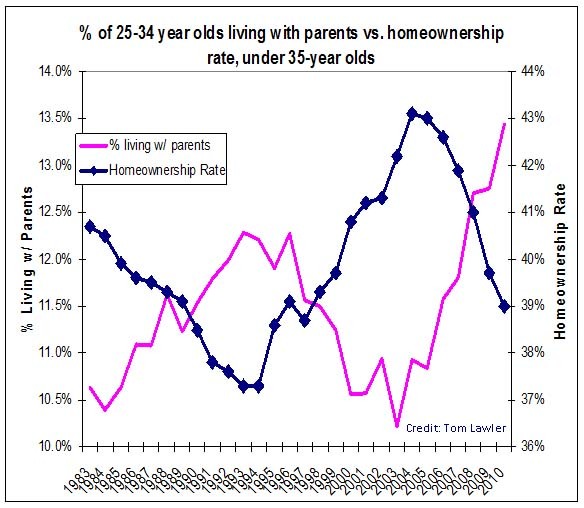 As this chart depicts there is a increasing trend of the so called "Boomerang Kids" coming home more and more. I think when a child reaches 23 years old and up they have an obligation to contribute to the family home. Is $50 per week so much to ask? Some parents believe and I do to that you are teaching that it's OK to depend on mom and dad when things are not going to well. Being able to come back to the nest may get to be a habit if the grown child is given free room and board. Are we as parents teaching are children well by making it easy for them. Free rent can encourage an entitlement sentiment in your children. For their sake charging them rent teaches many lessons. Now if there is some financial hardship for the child not to pay, then letting them stay for free is giving them necessary help in time of need. If you feel bad about taking money from your children then I propose you take it anyway and save it for when they move out. It can be used as a deposit, money to cover moving expenses, or to buy furniture. Your conscience can be relieved with this option. However, the decision is ultimately yours as a parent. You should make your decision based on what is best for your child. Does your decision move them forward or just enable them? Just make sure when your adult child moves back in that the ground rules and financial expectations are clearly outlined. Loans To Your Children - Great Idea?